Self-disclosure is literally the sine qua non of most approaches to counseling and psychotherapy. Due to a history of oppression, however, African Americans in the United States have been socialized to hide their true feelings, particularly when relating to Caucasians (Grier & Cobbs, 1968: Ridley, 1984). This can be problematic for African Americans who seek counseling because they are underrepresented (compared with their representation in the general population) as professional counselors and psychologists. Thus, if many African American clients are to receive counseling they will have to see Caucasian counselors. To the extent that self-disclosure is essential to successful counseling, it is important that Caucasian counselors attempt to overcome the barriers to self-disclosure that may exist between them and their African American clients (Vontress, 1971). A number of authors have suggested that Caucasian counselors need to confront openly the racial difference between them and their African American clients rather than to project an image of "color blindness" (Jones & Seagull, 1977). The term color blindness has been used euphemistically to describe the counselor who is either too insecure or too arrogant to acknowledge that racial differences may affect the course of counseling. Evidence that color blindness is viewed negatively by African Americans was documented in a study by Pomales, Claiborn, and LaFromboise (1986) African American undergraduate men and women were exposed to one of two videotapes of a Caucasian female counselor working with a African American male client The scripts for the two videotapes were identical except for three points at which the counselor's responses were varied to reflect cultural sensitivity or cultural blindness. Participants gave more positive ratings to the counselor under the culture-sensitive condition than under the culture-blind condition. Although the Pomales et al. (1986) study did compare the effects of counselor cultural sensitivity with counselor cultural blindness, it did not address the issue of dissimilarity confrontation. By openly acknowledging ethnic and cultural differences and the barriers they may produce, the counselor is demonstrating a sensitivity to the history and socialization of African Americans and his or her own willingness to deal with these issues before proceeding with counseling. The purpose of this study wad to expand on the Watkins and Terrell (1988) and Pomales et al. (1986) studies by employing dissimilarity confrontation as an independent variable, a measure of self-disclosure as a dependent variable, and a nonstudent population as participants. The current findings indicate that among African American adults, there is a direct relationship between mistrust of Caucasians in general and perceptions of a Caucasian counselor as a credible source of help. Although the relationships between dissimilarity confrontation and willingness to self-disclose and perceived counselor credibility were not found to be statistically significant, they were found to be directly correlated as hypothesized, and further research on dissimilarity confrontation seems justified. The current findings, however, suggest that Caucasian counselors will need to do more than simply confront racial and ethnic differences in an initial counseling session to build their credibility with adult African American clients. In the case of the fictitious counselor in this study, being Caucasian may have negatively affected his or her ascribed status, at least among mistrustful African American adults. An expressed philosophy of dissimilarity confrontation alone apparently did little to enhance the counselor's achieved status. Sue and Zane (1987) have identified three cultural issues that Caucasian counselors may need to focus on when attempting to build credibility with culturally different clients. First, client problems must be conceptualized in a manner that is consistent with the client's belief system. Second, the methods of resolving the problem must be compatible with the client's culture. And third, the goals of counseling held by the counselor must be consistent with those held by the client. Sue and Zane's (1987) analysis of achieved credibility suggests that it is a multifaceted phenomenon involving a number of counselor skills. Dissimilarity confrontation may be an important component of these skills but in isolation may have little or no impact. Some evidence was found that willingness to self-disclose to a Caucasian counselor increases with more income and decreases with more education. It can be hypothesized that African Americans, in order to achieve higher levels of income in a Caucasian-dominated world of work, may have to establish rapport with and learn to trust at least some Caucasians. On the other hand, more education may include increased knowledge about the history of African American oppression by Caucasians and may lead to less willingness to disclose to a Caucasian counselor. This is purely speculative, however, and the current findings may be unique to African Americans participating in the cooperating Afro-American Community Center. More research is needed on the relationships between African American income and education and willingness to self-disclose to a counselor. - Poston, Carlos, Craine, Micael, & Donald Atkinson; Counselor dissimilarity confrontation, client cultural mistrust, and willingness to self-disclose; Journal of Multicultural Counseling & Development; Apr 1991, Vol. 19, Issue 2. The preceding section contained information about client cultural mistrust and willingness to self-disclose. Write three case study examples regarding how you might use the content of this section in your practice. 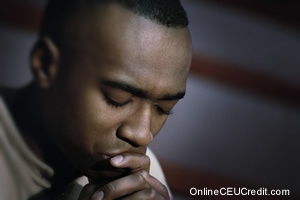 What are the four areas in which African Americans may be unwilling to self-disclose to Caucasian counselors? Record the letter of the correct answer the Ethics CEU Answer Booklet.